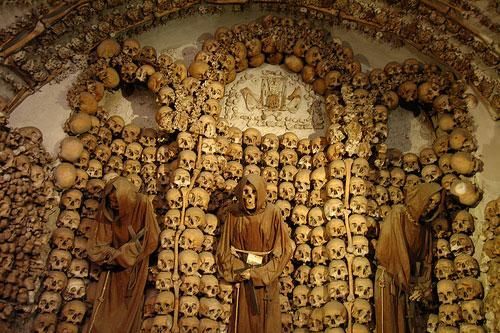 If you’re tiring of art, beauty and gelato and you’re not entirely creeped out by the thought of the dead, then why not head off to (in my opinion) Rome’s most macabre and morbid spot - the Museum and Crypt of the Capuchin Monks. Yes, 8 euros 50 cents will buy you an interesting little history of this religious order. Of course, that’s not actually what you’re paying for, when you visit this small, 17th century church. What you’re really there to see is the bizarre, even ghoulish, displays that exist in the church crypt - made up of thousands of skulls and bones! The crypt contains the remains of over 3,500 bodies - it is believed that they were monks (friars) and their followers. Set out in six small chapels (all named after different body parts, including pelvises and leg bones) the skulls and bones you will see are not laid about randomly - on the contrary, they are put together in quite elaborate displays. It’s a strange, and somewhat disconcerting idea, that you are - in fact - looking at displays of art entirely made of human remains. What I found particularly intriguing is that some of the monks’ skeletons were dressed in their robes . These famous brown habits are called ‘ capuche’, (‘hood’ in Italian) from which the word ‘cappucino’ is derived. The monks were told to transfer all of their possession - which included the bones - to what is now their current resting place. With their view of the afterlife, of course, it meant the entire Order would now be able to spend eternity together. Wandering through the chapels isn’t just fascinating but also sobering - an apt reminder of the path we all tread (and where it ends). Please note that there is absolutely NO PHOTOGRAPHY allowed (and you will be stopped in your tracks, should you try to furtively use your mobile). This is why all of the photos I’ve used here are credited from others (probably in the days before they introduced this rule, when the church wasn’t well-known). You can, however, purchase postcards in the gift shop afterwards, for one euro each. You should also be dressed modestly (no short skirts or bare shoulders) and no food or drink brought in either. These rules are reasonable, I feel, and should be respected. Opinions vary as to whether you should take your children - my friend’s kids walked out (they said it reeked of decay and despair). Some teenagers, however, will - I suspect - be thrilled by this very ghoulish and morbid place. Just be prepared for night terrors to follow (and the possible expense of some therapy too). Personally, I thought it was both macabre and magnificent!